The subsequent time that followed on 11th April after publishing the last post, was a real blessed one. The preceding post was concise and compact and it must have made the desired effect; I was reflecting……I thought to myself that sometimes it is better to say less and think more and just a few words can deliver the message and drive home the point so why say more. It is the duty of the disciple like me and the other seekers to extract more from less. Have I understood what God is telling me through these posts? I was asking myself the preceding night before I slept soundly after a long day’s work. At 4 a.m, I all at once woke up extremely fresh to an atmosphere devoid of any disturbing sounds around. The moment even before I opened my eyes, I was very much ecstatic. I smiled mildly. Before my eyelids had released themselves, I had seen a beautiful panorama not in my dreams but in a much wakeful state. I saw a very vast white Light in far vicinity. It was as though this Light had kissed me very gently and had woken me up extremely daintily to say something to me most lovingly. I bowed down to it with due respect and utmost gratefulness and made sure that I did not go back to sleep. In the next instant, the big blob of Light reappeared and this time I willfully plodded into it in order to bond and unite with it sophisticatedly. I felt calm, chaste and pure by doing this; I even felt elated. For a second time, I saw the vast Light and I repeated my deliberate action of bonding with this Light by entering within it and my happiness knew no bounds when this occurred a couple of times. Each time, the Light became more denser and wider than before and every time I became more joyous than the previous time. I was highly ecstatic. My willful desire of embracing the white Divine Light got more intense each time it reappeared and it made me absolutely sacrosanct, chaste, blessed and christened. I wished and was keen on continuing of these blessed and sacred influences over me. But then, had it not been for my frail state of health, I would have willingly pushed myself hard enough to hold on to this exotic transcendental experience but I let go and I went back to sleep securely. When I woke up around 8 a.m. or so, I reconnected and recounted instantly the mystic experience that I had just undergone a few hours ago. After all it was not an ordinary experience and knowing its rich value, I decided to let it unfold itself throughout the day. My sincere quest to know from God whether at all my humble submission of a few words as a blog entry of 10th April had made a little impact on others was awaited. I was also keen to know if I had done my job well of writing an article and how are people being stimulated, facilitated and rewarded by my consistent efforts. In a flash, I related well and comprehended undoubtedly that people have been guided, promoted and have yielded good impact on their consciousness. My efforts have surely yielded positive impact because of which I had this extra ordinary experience with God’s agreement. I linked my early morning divine experience with the question I had raised in my mind and found my answer. Certainly, God had blessed me by appearing before me as dazzling Light many times not only to authorize my question’s answer but also as an affirmation of its everlasting presence inside me. I realized simultaneaously and there was no doubt about it anymore What more evidence can one ask for? We only have to understand it ourselves inwardly, this I confirmed to myself. Peace and calmness lingered as I left the bed. Peace and calmness was embedded all around me and it protracted as the day opened and unfolded itself. I could sense the invisible shiny particles of divine peace and calmness in the space between two big objects in the room. I could also see them with my eyes. They were tiny sparks floating like fireflies at night. In front of me were the unseen, extremely light jumping atoms of Cosmic Light spreading over its established, time honored and proven presence in my home. Their impact in my house and around my body was impeccable and had to be trusted and believed in tremendously. Inwardly bending down in veneration to the unseen, vehement, blazing divine presence, I worshipped it secretly in adoration. The ecstatic state of the Consciousness of the Divine was continuing until afternoon when I decided to take a short nap and rest. The blessed moments of the early morning were relived before I went to sleep effortlessly. I slept very soundly for a good amount of time and when I woke up and sat in the bed, I was still in the same consciousness of the Divine. Nothing could break my link with the Supreme today; rather it got more acute when I got up. I was devoid of any rolling or broadcasting thoughts for quite a plentiful time. The absence of thoughts was the harbinger of a state of mind which fell absolutely silent and quiet. It was undeniably extremely soundless; I had infallibly touched the bottom of a deep, serene ocean. From extreme joy in morning meditation to extreme silence and peace in the afternoon meditative state of mind; this journey was so refreshing. My soul had manifested itself two of its rich attributes and endearing elements-joy and peace in two different periods of a day. The enriching day was my prayer that was answered because the worldly attritions are sometime sorrowful and agonizing, while the uncontaminated world of Divine elements inside us is so lovable and soothing. The joy and lingering peace in our soul is like a mother’s lap; we can repose in it whenever the troubles and sorrows in this world are unbearable. Our soul has unbelievable regeneration powers; it can supply energy and vigour to us unendingly. It has insurmountable healing powers; we must heal all our wounds and abrasions with this medicine. The antidote to all sorts of worldly sufferings and sorrows lies in our very own soul. The remedy to all unhappiness and gloom is sharing this divine bliss and peace with all. The cure to all mental discontent lies within. All repose and poise is inside……. Our soul is beautiful. It has endearing love inside. It has infinite peace within it. It is made up of pure divine bliss and ecstasy. Love, truthfulness, divine bliss, purity, tolerance, equilibrium of mind, sustained calmness, quietude and serenity, non violence and forgiveness are a seasoned aspirant’s qualities. Cultivate them if you wish to become one. And such a yogi is above the dualities of this ephemeral world. The dualities of happiness and sorrow, health and sickness, love and hate, loss and gain, honour and dishonour, dealth and life and such other things. 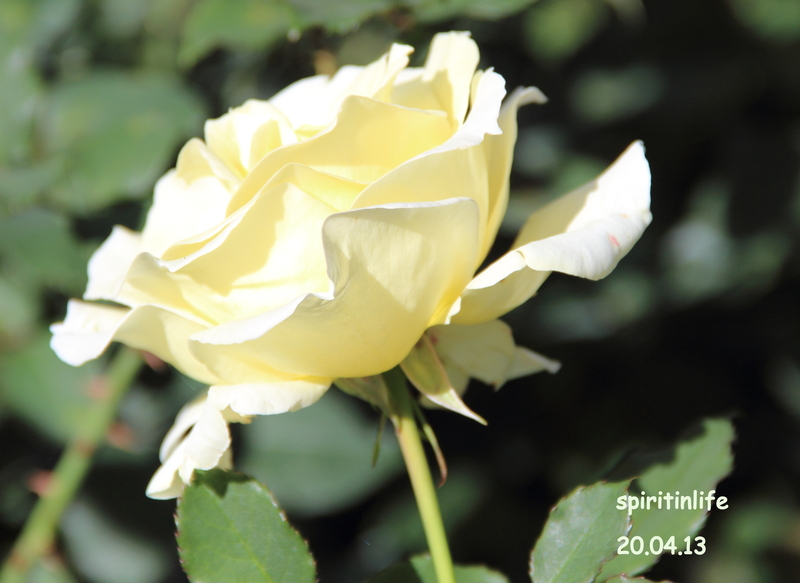 You are currently browsing the Spirit in life blog archives for the day Saturday, April 20th, 2013.